Auburn Village Rehabilitation and Skilled Nursing residents, DeKalb High School- New Tech Network, the community and steel company SDI will join hosts Auburn Village Rehabilitation and Skilled Nursing, DeKalb Health Foundation and Southern Care Hospice in Auburn, Indiana to celebrate Rock for Kindness with two exciting events! On Tuesday, September 12, 2017 at 1:30 p.m. Auburn Village Rehabilitation and Skilled Nursing (1751 Wesley Road, Auburn, IN 46706) will host the first event. 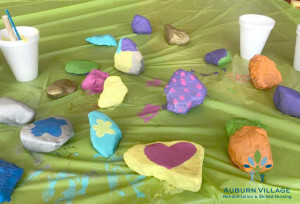 DeKalb High School along with Auburn Village’s residents and steel company SDI will paint the inspirational rocks in a variety of exciting colors. This event is in conjunction with Rock for Kindness. The project’s goal is to promote random acts of kindness to unsuspecting recipients; whether by painting and dropping inspirational rocks or some other cool and creative ways to bring kindness into the world. On Thursday, October 5, 2017 from 4:30 to 6 p.m. at Auburn Village Rehabilitation and Skilled Nursing facility will host the second event. The community along with residents and staff will write inspirational messages on the pre-painted rocks and hide them in the community. Everyone will enjoy refreshments via DeKalb Health, an on-site pretzel truck and local entertainment. When the rocks are found by other members in the community, they can return them to Auburn Village’s kindness basket. Auburn Village has a rich history of providing quality healthcare throughout the northeast Indiana region for decades. Known for compassionate person-centered care, concierge-level service, and quality-of-life activities, the Auburn Village family is proud to host this event along with respected and esteemed professionals- Dekalb Health Foundation, and Southern Care Hospice. Follow their hashtag #kindnessrocksauburn for highlights from these special events and also follow #thekindnessrockproject – the official hashtag of the project.